You are here: Home / Mobile Workforce / What Will Happen With Mobile Computing In 2014? Now that smartphones and tablet computers have gained a firm foothold in the business marketplace, mobile computing should continue to expand throughout all sizes of organizations, which in turn will cause increases in employee connectivity and productivity. In the federal market alone, for example, a new survey predicts that federal workers could save up to 364 hours and gain up to $14,000 per year in productivity by remaining better connected to their agency’s network. There are several reasons for the continued growth of mobile computing. The price of mobile devices is easier for more employees to afford, and more and more organizations have a BYOD (Bring Your Own Device) policy that permits employees to incorporate their smartphones and tablet computers into their daily work activities. Businesses have also discovered that the gains in employee productivity justify the costs of purchasing these devices and integrating them into a work environment. Mobile devices have potential applications in virtually any part of an organization. Business development employees may use a tablet computer to display the noteworthy features of a new product or service to potential sales prospects. Retail businesses have smartphones that enable customers to pay for purchases without the necessity of physically being near a cash register. Executives use their mobile devices to research and buy products and services for their companies, in addition to normal office tasks such as writing e-mail, reading e-mail and texting. Now that companies see the improved flexibility that smartphones and tablet computers provide to their employees as well as the time saved by mobile devices, they will experience sizable increases in revenue as a result when they decide to invest in these devices. Small to medium size companies may see a bigger benefit since these mobile devices provide a competitive advantage that outweighs their lack of staff. Mobile data collection and mobile workforce management through the use of smartphones and tablet computers should undergo a similar expansion. Mobile data collection is adaptable for a host of different industries — such as energy, health and agriculture — where field workers need to collect and process large amounts of data quickly. And with an increasing number of telecommuting employees working outside of a conventional office environment, a reliable method of monitoring field employee activity and remaining in constant contact with field employees will also be a necessity in many companies. To discover more information about the benefits of mobile data collection and mobile workforce management with COMMANDmobile®, request a product demo or view our video. 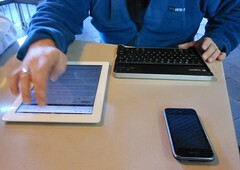 Is Mobile Computing Set To Dominate Businesses?